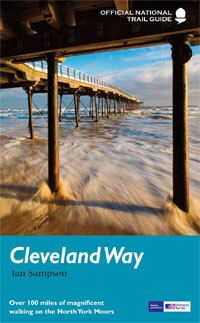 Published in association with the Countryside Commission and the Ordnance Survey, this book calls itself the 'official' guide to the Cleveland Way. The route is divided into 9 sections. Each one starts with good clear route-finding instructions. They are written in the context of the accompanying 1:25,000 OS maps. The text contains reference numbers and letters to features of the walk to be identified on the maps. Working together in this way, text and map provide route-finding that you can feel comfortable with. At the end of each section Sampson highlights points of interest along the route. These points are well written, including a wide variety of ideas: historical, industrial, archaeological, geological. Placed at the end of the route-finding sections, they allow you to find your way around the book as well as on the walk, and you can dip into them rather than be oppressed by them. The writer makes some suggestions for additional circular walks along the way. The coloured maps give the book an appealing atmosphere, enhanced by some fine colour photography of the landscape in a full range of moods. You will find brief but useful ideas on planning your walk, including your choice of equipment, general guidance on accommodation and ways of contacting supporting agencies. Ian Sampson's guide offers you sensible support along your route and keeps you in touch with all that's interesting in the landscape around you.